When will people wake up to the fact that investing in gold mining shares is not a good idea? What are the experts seeing and thinking when they talk about the “positive outlook for mining shares”? For the life of me, I just don’t get it. And, as far as gold stocks outperforming gold, well, just forget about it. 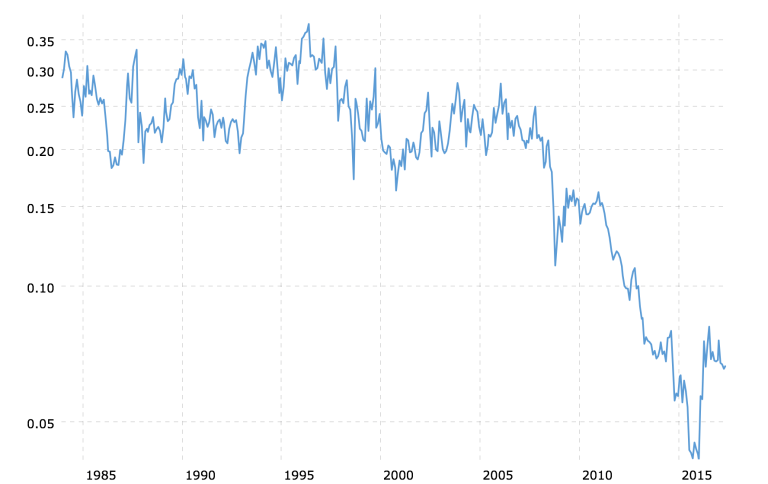 For twenty-five years, from 1983 to 2008, the ratio pretty much stayed within a range of .20 to .35 but, after that, the bottom fell out. What is ironic, is that while gold’s price was rising strongly from its low of $260.00 to its eventual high of nearly $1900.00, the ratio was dropping – from .30 to .11. So much for the leveraged advantage of gold mining shares over gold bullion. Adding insult to injury, mining shares ‘outperformed’ gold bullion – on the downside, with the ratio dropping to .04 in January 2016. The HUI-to-gold ratio chart covers a shorter period (twenty-two years) than the previous chart, and there are differences in the scope and timing of trends and price points in the two ratios. 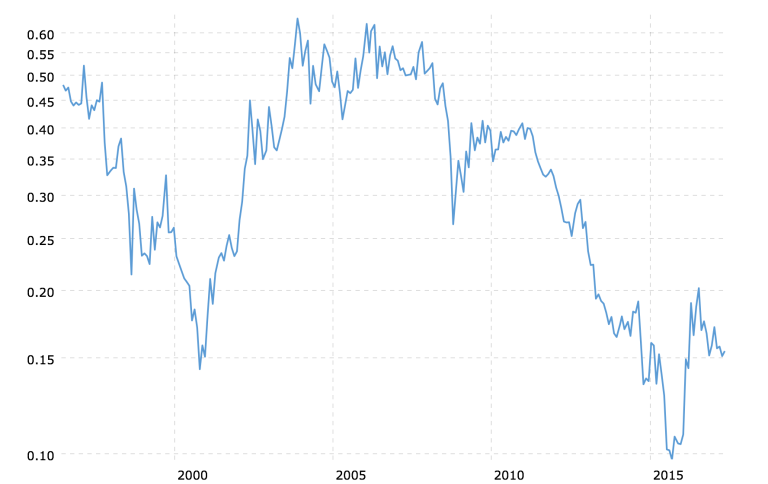 For example, the XAU-to-gold ratio peaked in May 1996, whereas, the HUI-to-gold ratio peaked in November 2003. 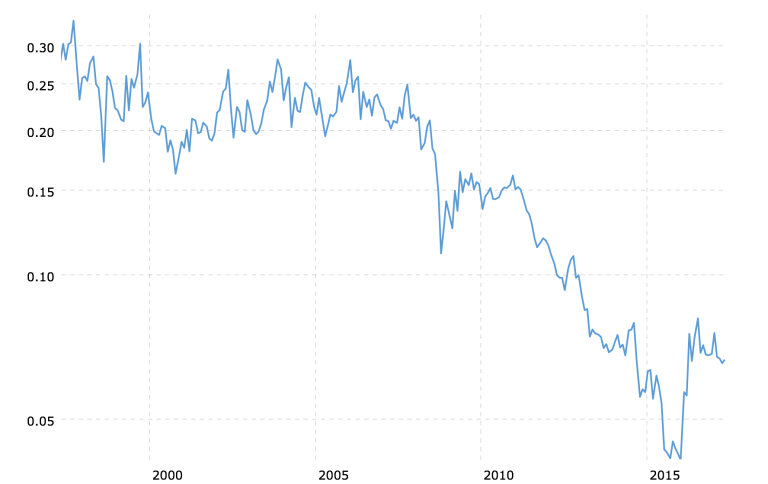 Also, the XAU index is comprised of more traditional mining companies. The HUI index has more of the newer, more speculative companies, and is more broadly based. However, even allowing for those differences, the patterns and impressions are similar. Not a pretty picture if you own gold stocks instead of gold bullion. Gold stocks have underperformed relative to gold, and woefully underperformed according to expectations. And it isn’t getting any better. Most gold stocks today are priced about where they were in 2003, when the HUI-to-gold ratio peaked. Yet gold, since 2003, is up nearly two hundred percent.